My author in the spotlight today is a fellow Edinburgh resident, Elle Turner. Her collection of short stories, Tapestry, was published last September. More about the book below – you can order a copy here: Tapestry. Thanks for taking part Elle. First of all, would you tell me a little about yourself? I live in Edinburgh (an ex-Porty girl, in fact), I’m married and have two sons. They’re twins – teenagers now so we’re well through the baby phase. Although I’ve written on and off since I was about eight, it was only when I had my boys that I started thinking about pursuing writing seriously. Around the same time as my boys started pre-school, I saw an advert in a newspaper for a Writers Bureau course. That was a really good place to start as it allowed me to try different types of writing – fiction and non-fiction. It helped me figure out what I wanted to write and, although it took me a few years to find my focus and it wasn’t until I joined the Romantic Novelists’ Association New Writers’ Scheme that I really got going, I knew writing was finally something I was going to do seriously. I’m looking for an agent and/or traditional publisher for my novels. Please keep your fingers crossed for me! I decided to self-publish Tapestry to get experience of that side of the business, and just to see what happened, really. I’m very glad I did. Tapestry is a collection of twelve short stories about the complexities of life and love. I wanted to write stories about love in different guises, whether romantic love, familial love or obsessive love and took the opportunity to explore the darker, sadder sides of the emotion too. Joanne, you would not believe how long that took me! I went through SO many titles and nothing was quite right. Now I can’t believe I didn’t think of Tapestry immediately. The stories are a tapestry of what I hope are moving tales, both happy and less so. How did you celebrate publication day? I celebrated with online buddies mainly, although I did pop in to see my mum and dad! I couldn’t really settle, though. I wanted to get back online to see what was happening! Online buddies were marvellous, really supportive on Facebook and Twitter. It was such an exciting day I was exhausted by teatime! Yes, I’m editing at the moment and will be submitting to the New Writers’ Scheme by August. I’m also thinking about possibly taking a couple of characters from Tapestry and putting them in a Christmas novella, but maybe not this year. We’ll see, though. I’m a massive fan of the singer Sara Bareilles. She brought out an autobiography, Sounds Like Me, late last year. That was my favourite read of 2015 and I haven’t found anything to top it yet. I haven’t read any other autobiographies, but it was Sara’s, so I had to. I always find her lyrics inspiring and her autobiography was too. 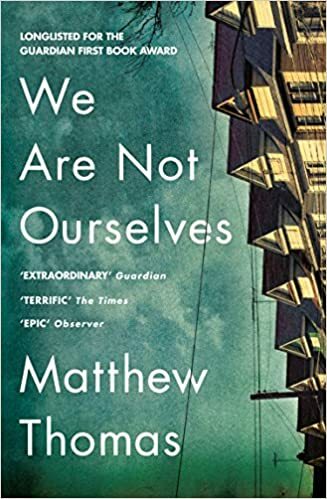 It’s March 2016 and I’m reading We are not Ourselves by Matthew Thomas. It’s about an Irish-American family living in New York. I think it’s going to take us through the main character’s life from childhood in the 1950s. I’m not far into it yet, but so far so good. I like both paperbacks and ebooks and don’t really have a preference. I like the feel of a paperback but, because I mostly read when I’m out of the house, a Kindle is really easier. It’s taking me a bit of time to get through We are not Ourselves because I have it in paperback and, as its over 600 pages, I can’t always fit it in my bag. Most of my reading is done on the bus, to be honest. My blog is at www.elleturnerwriter.com and I’m on Twitter @ElleTWriter , Facebook elleturnerwriter and Instagram elletwriter. I’d love to see you there! I’m going to go for Joy Marchwood in the Abbey Girls series by Elsie J Oxenham. My mum gave me some of the Abbey books when I was little. It was a series about young women and schoolgirls growing up near an Abbey in High Wycombe, and I was very taken with them. Red-haired Joan and Joy were the original Abbey Girls and the series followed them into adulthood, with eventually their own children following the original Abbey Girls’ traditions. From the time I read my first Abbey book I wanted to have red hair like Joy. That stayed with me into my early adult years during which time I tried several shades! Thank you so much again, Joanne, for having me on Portobello book blog. Nice to be back by the sea again! Best wishes to you and your readers. Happy Reading! It’s a good photo isn’t it? Not mine though I have read some of those. Just found the photo online.